New Battery - any reset/relearn necessary? I put a new battery in my 2011 xk about 8 month ago. This was a DIY job. No problem since then, which would make me believe I have a battery issue (however have some AFS problems that started about 4 month ago and TPMS problem since installed new wheels 3 month ago). For Xmas I got Nigel Thorley‘s XK/XKR book (new edition including additional chapters on x150) and on page 203 he writes that ....see excerp in picture. Can anybody confirm that fitting a new battery requires some system reset done by the jag dealer?? It is actually the 2010 MY on that have the BMS. Strictly speaking you are supposed to use SDD when you replace the battery but I doubt many people do. 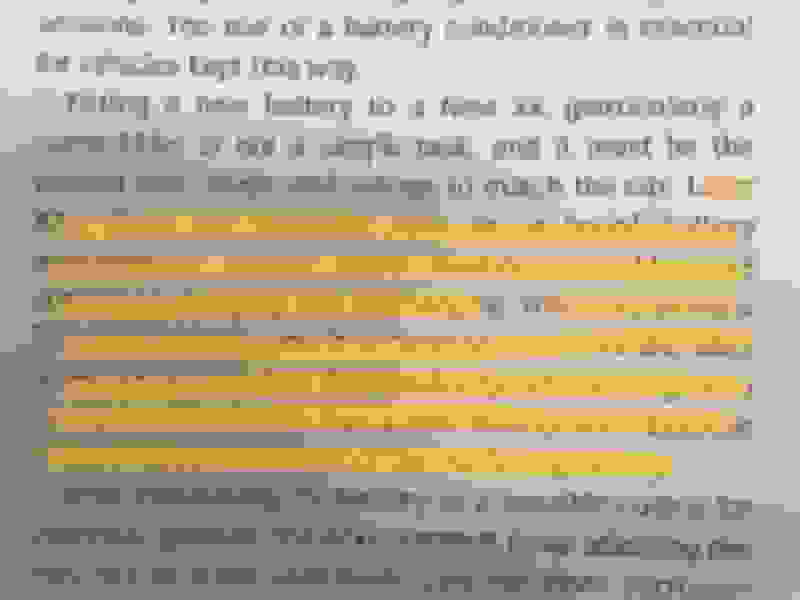 The workshop manual says to not put battery chargers directly on the battery terminals for the same reason but then goes on to say that it will sort itself out eventually so I wouldn't worry about it too much unless you have your own SDD tool. As I understand it if you do not get the system reset it will charge based on the previous battery requirements. Because of the charging rate it would prematurely cause battery issues. There is info in the shop manual regarding how the system works and this is for the MY 2010 to 2015. There are also some articles on the web that discuss how this system works. Per his Personal Profile the OP, Ter11, is in Switzerland. I'm pretty sure that the model year for all European market 5.0L X150 models began with 2009, and not 2010 as in the North American market. That's because the X150 was introduced as a 2006 model in the UK and a 2007 model in the USA. Ter11's 2011 XKR would be a 2012 in the USA. Confused? The Battery Monitoring System began with the 5.0L models, regardless of model year. That's an easier way to remember it. Isn't advice from New Zealand upside down in the Northern Hemisphere? Last edited by Stuart S; 02-02-2019 at 04:56 PM. I'm pretty sure that the model year for all European market 5.0L X150 models began with 2009, and not 2010 as in the North American market. You seem to keep confusing model year with registration year. ALL 5 litre XK's started with the 2010 MY, even those built and registered in 2008. The XK 5.0 litre (with AJ-V8 Gen III engine) was introduced at the Geneva Motor Show in March 2009 and designated 2010 Model Year. It went on sale in European markets in 2009. Starting in 2014, the Model Year was harmonised with Calendar Year. Traditionally the new Model Year (MY) for Jaguar had commenced in August. This was because a new Model Year was always introduced after the factory Summer shut down. So, I have an XKR 5.0 SC 2010, with the original battery and I want to install an AGM battery. 1. Do I need to reset something with an SDD? 2. There is another tool to perform the reset? I have an IcarSoft LRII. You should reset the BMS (battery monitoring system) using an SDD or equivalent. All X150 models (4.2L and 5.0L) came from the factory with conventional (wet cell) batteries and the voltage regulators were calibrated accordingly. Many X150 owners have upgraded to AGM batteries with no problems, even though the voltage regulator isn't exactly right to fully charge AGM. To ensure that your AGM battery is fully charged, I recommend using a CTEK battery maintainer (I have the CTEK MUS4.3 and like it) and be sure to set it to the Winter Mode (with the snowflake icon), which is the proper charging profile for AGM. See the CTEK Owner's Manual. All X150 models (4.2L and 5.0L) came from the factory with conventional (wet cell) batteries and the voltage regulators were calibrated accordingly. Many X150 owners have upgraded to AGM batteries with no problems, even though the voltage regulator isn't exactly right to fully charge AGM. Per Jaguar, this statement is inaccurate. See attached. Some 2010 onward were fitted with AGM. I stand corrected ... maybe. Because that Jaguar Technical Bulletin indicated a "VIN range" beginning with the 2010 model year and not the specific VIN numbers of those 5.0L X150 vehicles actually equipped with AGM batteries, it appears that this Bulletin may be a CYA document. Does Jaguar really know that AGMs were, in fact, fitted to 5.0Ls or is it just a possibility that AGM might have inadvertently been installed on the production line by mistake? The important point is to replace Flooded with Flooded, and AGM with AGM. Why? So that the charging profile of the alternator corresponds to the battery type. We know that every 4.2L X150 came from the factory with a flooded battery. No AGMs here. I don't recall any 5.0L X150 owner on this Forum who said that his car came from the factory with an AGM battery. If you're not the original owner you can't be sure because a previous owner could have replaced the OEM flooded battery with an AGM, unless your car has a Jaguar-branded battery and the sticker indicates AGM. If you're out there, please speak up! Or if you're a Jaguar Technician, let us know what you've seen. Even if I am wrong, and some 5.0L X150 models did, in fact, come from the factory with AGM batteries, I still stand by my recommendation to use a CTEK MUS4.3 battery maintainer set on Winter Mode to keep your AGM battery fully charged. I remember specifically asking my local Jaguar's shop foreman the question on AGM batteries for the XK. a few years ago. He told me no XKs (2006-2015) were fitted with AGM batteries from the factory and although it is mentioned about resetting the charging system after battery replacement, the dealership does not usually do it. I replaced my battery a few years ago and did not have it reset, and of course had zero problems. The way the system works, as I've read, it gradually learns the state of the battery regardless of Reset or not. Of course, I also seem to remember that a Hard Reset of the car also resets the Charging Deallie. SO, since a person replacing a battery ALREADY has the two cables in his/her hands, a couple seconds of "zap" will do the same thing a 20-minute dealer procedure @ $140/hour would do. As I recall there is a re-calibration process that the system goes through similar to the Ctek . I don't know if is by hours or by miles . As I recall the process consists of draining the battery while driving until it hit 12.6 volts but does not let it go below 12.2 volts. This starts the reconditioning process similar to the de-sulfur process. Then it would charge in various voltages until it reaches it's max potential. So what is it? Does the generator adjust for and AGM or not? Last edited by guy; 02-04-2019 at 03:32 PM. I went through the same line of questioning as you when my battery went flat about 2 years ago. I changed the battery myself. I called a dealer and asked about the reset. They didn't seem to know what I was talking about but they would reset my system for $150 if I wish. ??? I called another dealer and they said it is not necessary as it will re-learn it's charging rate "over some time". This makes sense to me so I went with it. 2 years later, still ok. I do put it on the C-Tek when it's not driven after a few days though. I don't think so. I couldn't find any information on this subject. 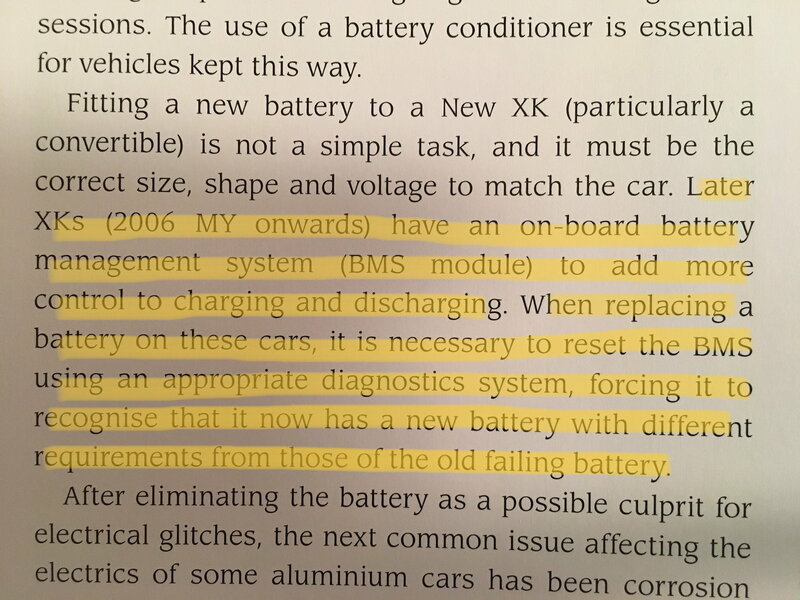 Jag docs do say that some cars were fitted with AGM but only specify to replace battery with "same type". Unfortunately, for those of us who bought used, we can only assume the previous service replaced same with same. That said, a bunch on here replaced flooded with AGM and report no issues so I'd think it's ok. I chickened out and replaced flooded with flooded. Thanks! I just did the same. Welp - I'm about to be a member of this club. I bought my 2010 used about 3 1/2 years ago with like 8000 miles on it. Car is my daily driver; never used a Ctek. I've had none of battery-related problems that others on here write about, at all. But... just went away for two weeks, during weather as cold as Southern Cal gets. Came back, battery was dead. Dead-dead-dead, tow guy had to rev the engine for 15 minutes dead. Interesting: when it came back to life, radio presets and seat presets were fine. Trip odometer and the clock were at 0. Also had the yellow-triangle "E-differential fault" and "adaptive dynamics fault" warnings, but I drove it for a few hours and those warnings were gone on the second startup. So now I'm fine, but don't want to risk that again. Well get a flooded Bosch battery at Pep Boys. The AGM is tempting, but I was fine with whatever I had so why tempt fate? Let them install it. It's not rocket science-- and it's free. Last edited by pk4144; 02-12-2019 at 10:00 PM. Quick Reply: New Battery - any reset/relearn necessary?